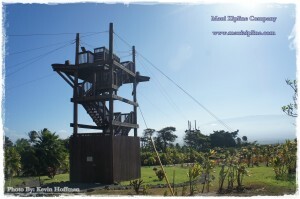 Just came to Maui Zipline Company in Waikapu, Hawaii and had an awesome time? Then you shared how tubular your time was ziplining to Trip Advisor or Facebook? Radical, so have hundreds of others. Well, before you left, you probably asked your cool guides about some sweet spots around Maui, especially close to our zipline. Nice. 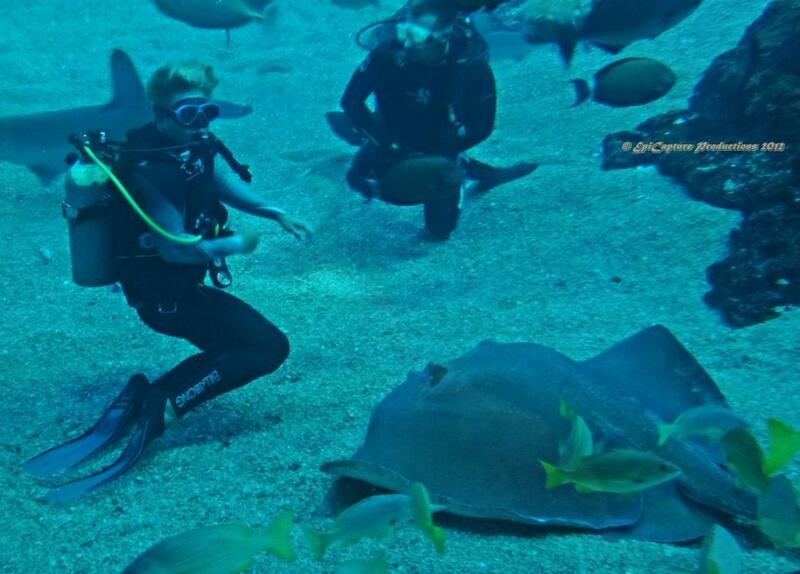 Here is a list of the Top Ten places and activities that your guides often will recommend, all within approximately 30 minutes of our course and mostly full family activities. 1. 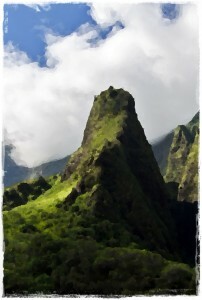 Iao Valley State Monument ~ Iao Valley, sometimes known as the “Iao Valley Needle,” is an awesome spot to spend the afternoon, especially on a Sunny Day in Wailuku. Located near Kahului, this Rainforest features impressive streams, waterfalls, and gardens; including the Kepaniwai Park’s Heritage Garden. Sometimes, during sunset, a bright pink sky will come across above the park here. Such a beautiful place, with fading memories of war. The Battle of Kepaniwai occurred here where Kamehameha the Great decimated the Maui armies in an attempt to unify the islands. The summit of this valley is the Pu’u Kukui, the 2nd wettest place in Hawaii, and this can be seen in the mountainside behind the Maui Zipline Company at Maui Tropical Plantation. This location is very easy to access for elderly, but in the upper lot one must pay for parking. 2. Kanaha Beach, a.k.a. Kite Beach ~ An easily accessible day of entertainment can be achieved simply by pulling up to Kite Beach, behind Kahului Harbor on Maui. The kite boarding and kite surfing world loves this beach, as it is a perfect place to catch major wind in the kite. One doesn’t even have to participate to feel the rush. Maui Zipline Company proudly sponsored the 2012 Virgin Kite Jam, held at this beach, where an array of boarders gathered from all over the world to exhibit their skills. Kite boarders can reach up to 80 ft. in the air, and do incredible tricks in this tropical paradise. Kanaha Beach is also an excellent place to watch sunrise during certain periods of the year. 5. Kamaole III in Kihei Town ~ If you leave our tour late in the afternoon, then head to many people’s favorite spot to observe sunset, Kam III in South Kihei. 100′s gather here daily to watch one of the most amazing sunsets on earth, shooting out bright pink and orange rays. Under one of the most incredible sunsets ever laid eyes on, take a dip in an often calm ocean. There is a grassy field to lay out on, and plenty of amenities down by the large beach and clear water. 6. Shopping in Paia Town ~ Paia is a beautiful part of Maui, with an interesting variety of people, shops, and restaurants. Sidewalks are cracked, there are only two major ways in and out of the city, and travelers line the streets; all at a nexus trying to find their way. The people of Paia often boast a smile, and one can shop for anything from bikinis to surfboards. As one walks the streets of Paia, rainbows often crest the hills near Haiku and Pukalani, upcountry. Be sure to visit some of the beaches listed below, which are all within 5 minutes of Paia (Ho’okipa and Baldwin Beach). 8. 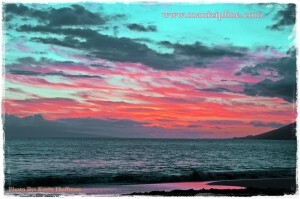 Baldwin Beach ~ A beautiful and scenic beach that lines a large portion of the incoming streets to Paia. Here one can watch anything from skateboarding to surfing to basketball, or one can just lay back and soak up the sun. There are three major beaches lining this road, and families are cautioned to stay either to the beach closest to town or the beach furthest from town, nothing in between. Just take our word for it. 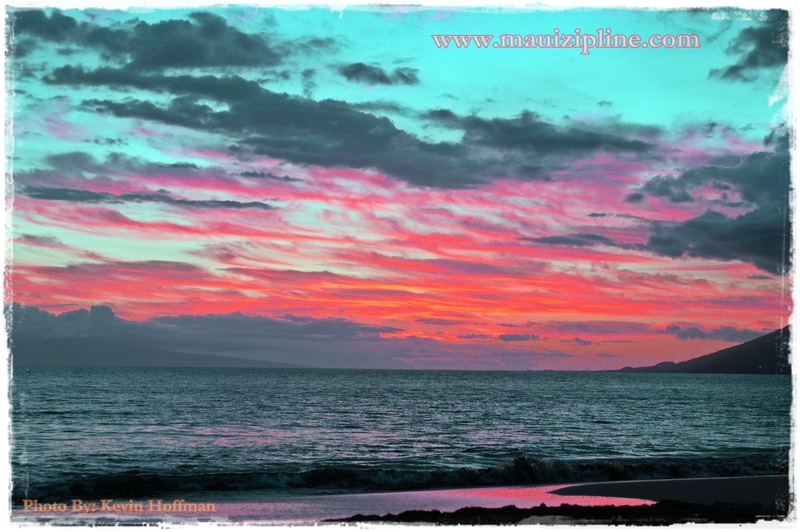 Those who venture here will enjoy a great view of the West Maui Mountains on a multiple mile stretch of beach. 10. Ho’okipa Beach ~ Known as one of the best surfing and windsurfing spots on Earth, Ho’okipa is a favorite place to take the family to observe the surfers and play in the tide pools. If the family is a little worn out from Ziplining, than playing on the beach in the waves is always an exciting option for families. Surfing and Kiting are for professionals only here, no amateurs. The reef is shallow and the waves are harsh, and can sometimes reach almost 25 feet! The beach is usually pretty though, so it is fun to linger here! Right up the street, Jaws can cause waves up to 70 ft. high! 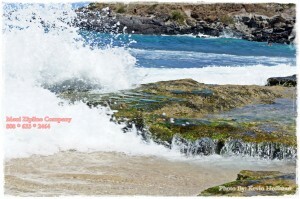 Exercise great caution when swimming here, but enjoy the views and sports activities! 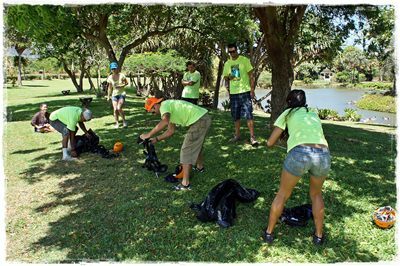 Anticipation was high for weeks as Maui Zipline’s guides prepared themselves for the first annual Zipline Olympics. Guides were verbally challenging each other all month, even though they did not know exactly how all of the events would go. Some guides were sent to collect coconuts around Maui Tropical Plantation, while others were told to build targets. Other guides unpacked carabiner after carabiner. All were excited to meet the challenges that lay before them. On Saturday morning, nine guides entered into the competition, full of caffeine and sugar, ready to leave victorious. The first event was to put together, and put on, a guest ziplining harness properly, as quickly as possible. This event was called “Suit Up”. All of the materials lay separately in a bag, and each guide had to spin around a pole five times before running to deal with the suits. Three at a time, and very dizzy, guides competed for the best time of putting on the suit. The next event was the “Speed Challenge”. Guides started from standard braking position, and had to hook up and climb 650 ft. of line backwards. They then had to touch the top pole, turn around, zipline down, and unhook completely at the end of the line. Guides were sweating hard and exerting all of their energy to get to the top. All of the lead times were within two seconds of each other. Impressive. Event three was the most tedious task of all: “Moving Carabiners”. Eleven carabiners were hooked up in different ringlets on a daisy chain, and had to be transferred to another daisy chain in the same position. Speed was intense as guides focused very hard on moving carabiners. The top three results were under 20 seconds! Great speed guides! The fourth event was the “Coconut Toss”. Each guide had to drop or toss a coconut into a large, two ring target floating in the pond under line number five. The trick here was guides had to be ziplining at full speed when they dropped the coconut! The challenge was on. The first round, only two guides hit the target, and on the second most guides hit the rings. What a hard challenge, the coconut had to drop almost 15 feet! The final event was just for fun, but was the most challenging for some: “Lock the Zipline Tower!” The most important event at the end of the day is often a slow walk out to the tower after being tired and locking it up. Now guides had to sprint a few hundred yards to tap the tower and get back to the kiosk. Most guides fell to the ground after the challenge, gasping for air, after putting every ounce of strength they had into the Zipline Olympics. Dinner and prizes got hooked up as the team watched sunset down at Kamaole III in Kihei. A good time was had by all, and everybody went home stuffed, sweaty, and happy. An awesome day at the Maui Zipline Olympics. For more information on the Zipline Olympics, or to check out more photos, visit our Facebook, Twitter, or Instagram to check out more! 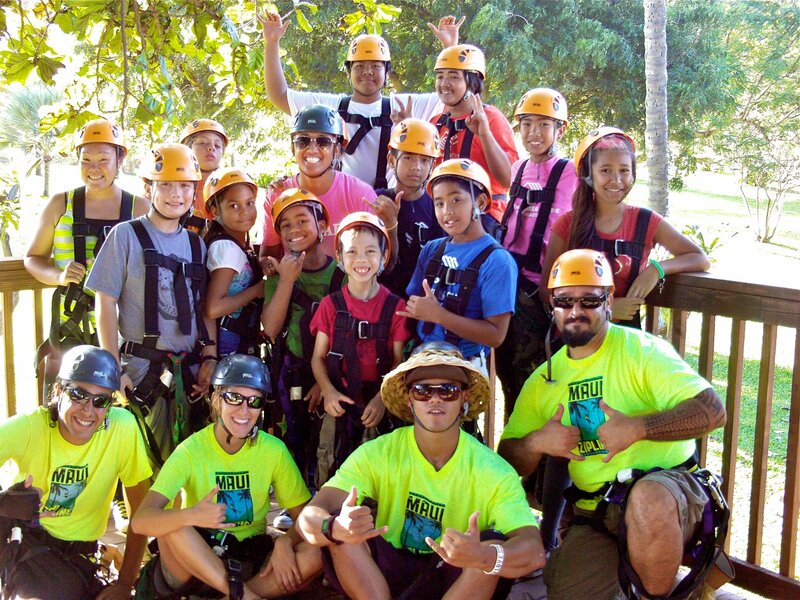 On September 8th, 2012, Maui Zipline Company had the privilege of hosting an incredible day of zipping for the Boys and Girls Club of Maui. The day began with warm light rain that continued sporadically throughout the day but couldn’t damper the spirits of these enthusiastic zippers. Screams of excitement and joy could be heard echoing from every corner of the plantation. There were more ear to ear smiles than an audition for a toothpaste commercial. From first timers to zipping veterans, thrills were had by all. The guides were pumped up and energized feeding off of the excitement from these great kids. Maui Paddler hosted classes paddling around the pond as well as a star navigation lesson. Other activities included a lesson on dry land Taro farming. More than 80 children enjoyed a day of cultural activities at Maui Tropical Plantation. 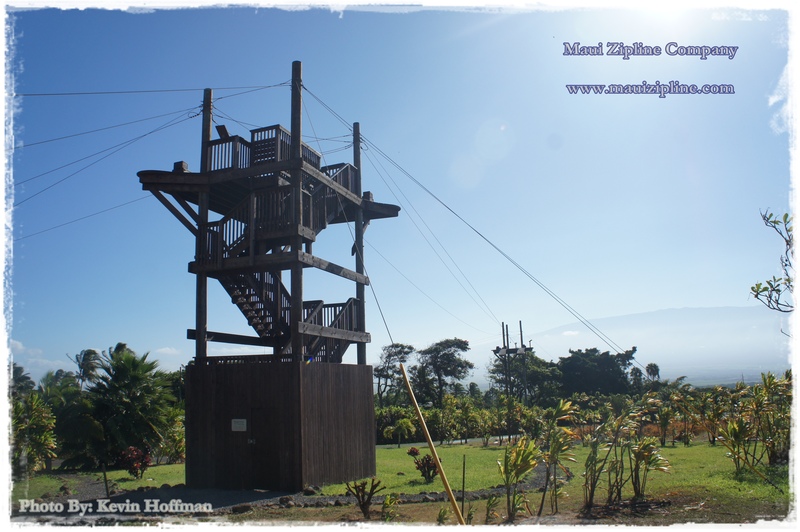 From our 50ft towers over tropical fruit trees and flowers set against breath taking views of the west Maui mountains, Haleakala, north and west shores, our little zippers pointed out their local neighborhoods and schools. By days end groups of keiki could be heard buzzing about their adventure while they enjoyed smoothies at the Mango Bar. We look forward to having them back very soon. Mahalo to everyone involved for make this event a huge success! Maui. Home of the Maui Gold. Originally they came from South America, ventured to the Caribbean and eventually to Europe. Initially know as ‘ananas’ or ‘excellent fruit’ to Europeans referred to them as ‘pines of the indies’. Ultimately, ‘apple’ got added, making them today’s pineapple! Pineapples have been a vehicle for international communication and exchange, known to by a symbol of friendship and hospitality. Though pineapples are not indigenous to Hawai’i, they were introduced in the early 1800’s and quickly became a favorite fruit. They are known as hala kahiki in Hawaiian. Starting on the island of O’ahu, James Dole had a family cannery and packing plant. Later in the early 1900’s, he convinced his family to invest in more land. This time he purchased 20,000 acres on Lānaʻi devoted solely to pineapple. Little Lānaʻi ended up providing over seventy-five percent of the world’s pineapple crop. Eventually, Mr. Dole also purchased some land on the island of Maui. In the early 1900’s there were some more pineapple competitors, the Baldwin brothers. This really launched the industry on Maui. Down the road, Maui Land & Pineapple Company Inc. was formed and made public. For a time, it was the largest grower, processor and shipper of Hawaiian pineapples in the United States. Sadly, Maui Land & Pine was the last producer of commercially Maui-grown pineapple, ending in 2009. Despite this, some good came out of it, the delicious “Maui Gold.” These are naturally sweet and much lower in acidity than other varieties. The only one of its kind and you can get it at the Maui Tropical Plantation, where we’re located! 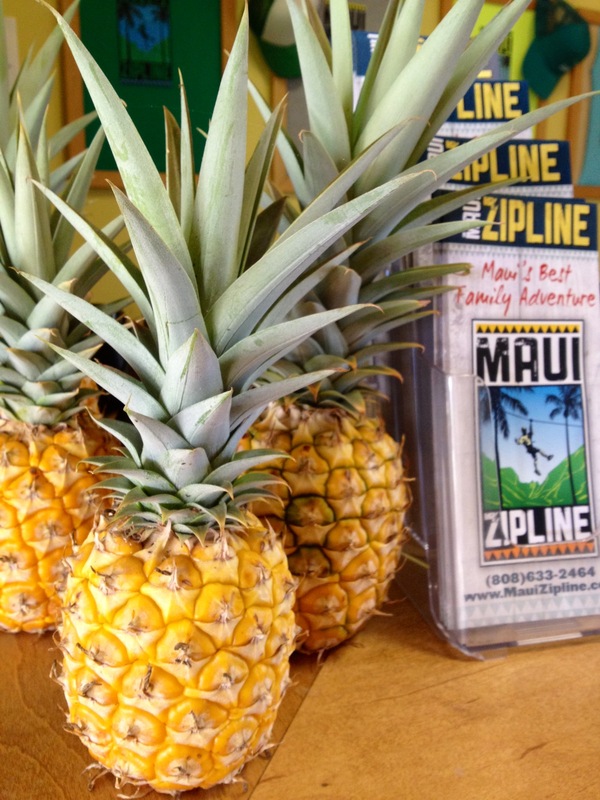 On your Maui Zipline tour you’ll learn that pineapples take approximately 18-22 months to grow. Each pineapple crown can grow about 5-7 more with the last being known as the “sugar baby” that is super sweet! Our guides will take you past Maui Gold’s in their natural habitat. You can even learn how to plant and grow your own pineapple! Maui no ka oi, or Maui is the best. We love to share what we learn with others, no matter how big or small. Come join us (link to book tour) and we’ll enlighten you and your ohana (family) with some other fun facts about our island, plants & food. One of the “sugar babies” picked fresh from underneath our zip line. Mahalo for sharing a few moments of your time! 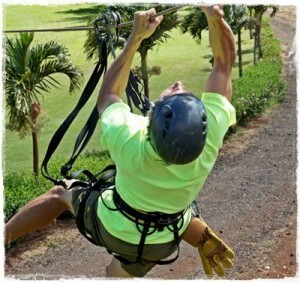 Maui Zipline Company is looking forward to meeting you! Sunday’s big football game between the New York Giants and New England Patriots drew much of the usual hype, crowds and fans to Indianapolis to see the teams battle it out again for the title of Superbowl Champions. And, the game was no disappointment! But, we couldn’t help but notice that much of this year’s buzz wasn’t about either teams offensive line, defensive line, or coach on the sideline… it was the zip line crossing over Superbowl Village that fans, celebrities and even the athletes couldn’t stop talking about! The bird’s eye view of Indy, and the chance to zip 800 feet over the crowds, drew guests from all over, some of whom waited in line for over 12 hours in the rain for the opportunity. 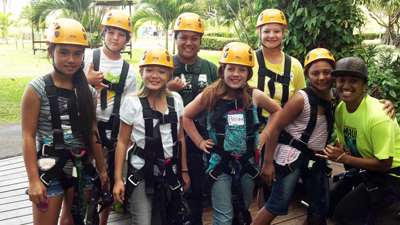 At Maui Zipline Company, we couldn’t help but smile to hear what a big hit the zipline was with the Superbowl crowd. We know first hand how exciting it is to step off a platform high in the air, and feel yourself soaring effortlessly over the landscape below, and we love to share that thrill with others. Maui is the birthplace of ziplining in the USA (the first one opened here in 2002) and we feel a sense of pride that our island’s most popular activity has gone mainstream on the mainland. Our Maui Zipline Adventure Tour at the Maui Tropical Plantation gives riders five times more zipline excitement than the Indy Superbowl line, on our five ziplines, all of which are side-by-side for the most interactive fun. Rather than zipping over crowds of football fans, riders as young as five years old soar over the beautiful manicured grounds of a working tropical plantation. And our birds-eye view is not of the industrial city of Indianapolis, but rather of the majestic Maui mountains, coastlines and central valley. If you weren’t among the lucky few hundred people who got to ride the Superbowl zipline, (or, if you DID get to ride it and got a good taste for how much fun ziplining can be), plan a trip to Maui and come visit us at the Maui Tropical Plantation. 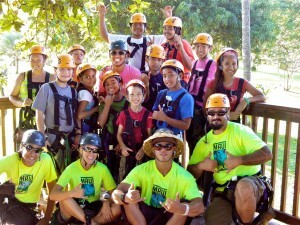 Book your reservation today https://mauizipline.com/book-a-tour.php, and let Maui Zipline Company show your family a super good time! Yesterday marked the beginning of the celebrations welcoming the Year of the Dragon in the Chinese Lunar calendar! Here in Maui we are fortunate to be able to celebrate both Western and Eastern New Years, and we are looking forward to the festivities over the next week! The Year of the Dragon is considered the luckiest year in the Chinese Zodiak, and Dragon people are thought to inspire confidence in others with their honesty and quick wit. Regardless of our personal zodiak signs, at Maui Zipline we are proud to inspire confidence in all our guests daily as we open the world of ziplining to everyone. If you’ve ever considered a zipline adventure, make this your lucky year and come zip with us at the Maui Tropical Plantation! The holiday season has zipped by us again, and we welcome the new year 2012! For us at Maui Zipline Company, the highlight of the holiday season was being able to spread joy to local keiki, through our involvement with Toys for Tots and the Boys and Girls Clubs of Maui. Throughout the month of December we collected toys for children and donated them through the Maui Streetbikers Union Annual Toy Drive, which was their most successful toy collection drive ever! We also loved the opportunity to bring a group of local Boys and Girls Club members on a memorable first-time zipline adventure, and their enthusiasm for the experience was contagious, giving us all big smiles to share through the season. Through the holiday weeks and into the new year we welcomed ziplining guests from all over the globe, and with each zipline tour shared with them the beauty and bounty of Maui, and invited them to bring the Aloha spirit back to their hometowns. Whether you are an experienced zipline enthusiast looking to pass the thrill on to your kids, an octogenarian looking to check ziplining off your “bucket list”, a nervous first-timer looking to challenge yourself, or a parent looking for that perfect tropical vacation photo-opportunity, look no further! 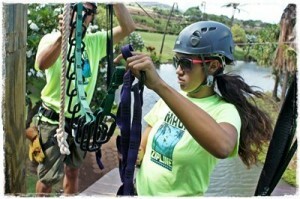 Make it your new year’s resolution to come on a Maui Zipline tropical adventure tour at the Maui Tropical Plantation. It is our new year’s resolution to make it your most fun and memorable, best-spent time in Hawaii. We feel so blessed to have been a part of this family’s experience on Maui, that we just have to share this review from the mother. It reminds us all at Maui Zipline just how fortunate we are to be able to bring joy to children through our tropical zipline adventure! “We took our 8 and 10 yr. old as we couldn’t find another co. that took an 8 year old who only weighs 50ish pounds. My 10 yr. old son at first was bummed. He thought it wouldn’t be as exciting as the other zipline places since it took younger kids and is HALF THE PRICE. Boy was he wrong!! For $90 a person, we not only saved over $100 each, but had the times of our lives!!! Hands down – this was the best thing we did while on the island. My 10 year old was totally pumped after it was over. He woke up this morning still talking about the blast he had yesterday. We are so excited to announce that we are joining the efforts of the Maui-based Toys for Tots campaigns this holiday season! We will have a toy drop off location here at the Maui Tropical Plantation, and we are giving a special gift to our guests who donate toys or funds. As Maui’s most family-friendly zipline tour, we get to spend all year spreading joy and sharing adventures with our guests of all ages, and we hope to be able to bring the joy of Christmas to local keiki who may not be so fortunate. We think this is a perfect opportunity to invite our visitors and local residents to help support Toys for Tots this season. We have found that many people want to donate toys and gifts to local children in need, but they just don’t know how. So, we are excited to provide this outlet for toy donation, and thrilled to be directly affecting the holidays of children on our islands. From now until December 17, Maui Zipline tour guests and Maui Tropical Plantation visitors who bring a new, unwrapped toy for a child, or a make a minimum $10 donation will receive a free Maui Zipline souvenir gift. Nationwide, the Toys for Tots program is carried out by the U.S. Marine Corps, with the mission of collecting new, unwrapped toys and distributing those toys as Christmas gifts to needy children in the community in which the campaign is conducted. Maui Zipline identified the need for more toy drop off locations and more local support on Maui because toys are distributed in the regions they are collected, and because we are removed from the mainland, Hawaii usually has more needy families than toys we are able to collect. We want to expand the reach of Toys for Tots in Maui County, by increasing awareness of the program among island residents, and promoting this opportunity to our visitors. All toys and funds collected will be distributed directly to help Hawaii’s local children on Maui, Molokai and Lanai. Especially because there is no Marine outpost on Maui, Toys for Tots is often overlooked here. Fortunately, MinitStop sponsors toy drives statewide, and the Maui chapter of Street Bikers Union Hawaii (SBU) partners annually with the Salvation Army to conduct Toys for Tots collections and fundraisers, and deliver the toys to children. This year marks the tenth anniversary of the the largest fundraising event, the Maui SBU Christmas toy run and bikers’ parade to support Toys for Tots. On Sunday, December 18 bikers, sponsors, including Maui Zipline, and guests will participate in a gathering of toys, a bikers’ parade from Kahului to Lahaina and back, and a fundraising party to which all are welcome. For more information on how you, your family or organization can help us support Toys for Tots with toy collections this month, please contact judy@mauizipline.com. Happy Halloween from Maui Zipline and the Maui Tropical Plantation! Halloween is back on Front Street this year, and at Maui Zipline we are getting into the spirit of the spooky season! If you’re looking for a family-friendly way to participate in Halloween on Maui, come join our cast of characters for a freaky-fun zipline adventure this weekend!